During the industrial revolution at the turn of the 20th century, ordering kit houses constructed with light-frame balloon framing and pre-cut timber became common. The East and West Coasts of the US had been connected through the Transcontinental Railroad in 1869, and the American population was rapidly expanding into the West, where there were very few established settlements. There was an urgent need for prefabricated, affordable, and easily constructed housing. One of the first mail-order kit home systems was Aladdin Homes, founded in 1906 by two brothers, W.J. and O.E. Sovereign. The brothers formed their system by adapting previously established mail-order systems used to purchase boats, which buyers purchased to assemble themselves. They used the popularized mass production concepts of the time, and applied these systems to create mass housing, and they marketed a "Readi-Cut" system. In this system, all the lumber necessary to create a specified house was pre-cut in a factory and delivered to the housing site, and all the customer needed were basic tools to put the house together. This process was designed to streamline the construction process by decreasing the time needed to erect the house, and by removing the wasted materials caused by miscalculations onsite. Chicago-based Sears Roebuck and Company followed the first mail-order mass housing systems, like that of Aladdin Homes, and was able to sustain pre-fab housing efforts due to an increased use of marketing. Sears Roebuck and Co.'s main success was the fact that they could offer a wide variety of housing and financing. Over their 32 years in business, a large team of designers and architects produced 445 different models, which ranged from one room structures to multifamily units. 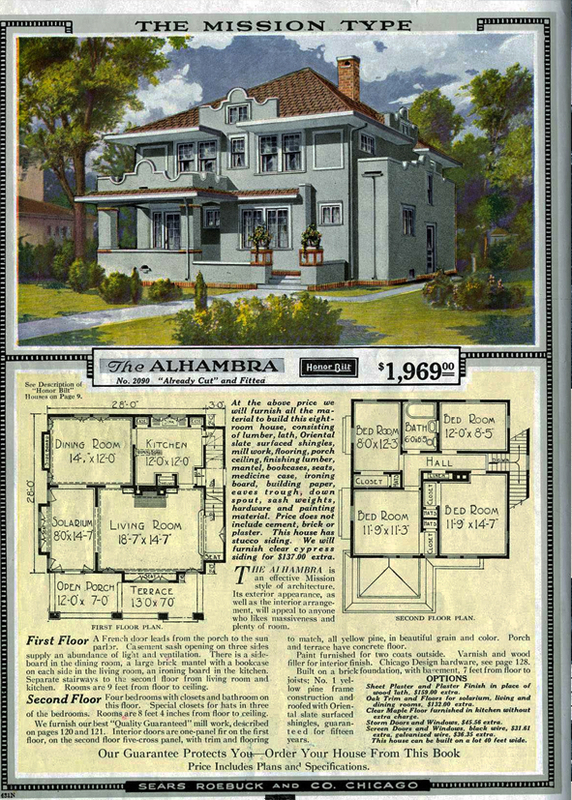 From 1908 to 1940 Sears Roebuck and Co. was the world's leader in prefabricated residential design and manufacturing. 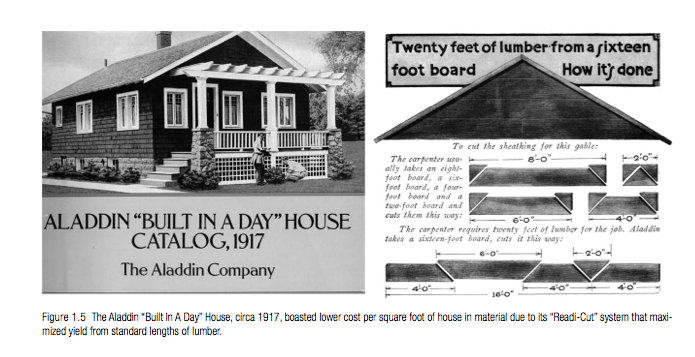 Sears, Aladdin, and other kit home manufacturers never claimed to change architectural design, but rather provide a more efficient system of production and construction, while offering a standardized and affordable product to the consumer. Ultimately, both Sears and Aladdin failed during the housing crisis of the Great Depression and they pulled their catalogs. "Sears Catalogue Homes." MoMA Org., accessed December 5, 2012. http://www.momahomedelivery.org/.